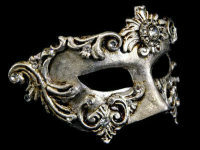 Show off your romantic side with this stunning Sole Luxury Venetian Masquerade Ball Mask in silver from Simply Masquerade. 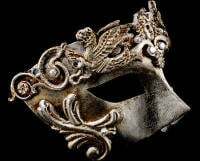 With a modern, contemporary design that is certain to capture anyones heart, this stunning mask features a aged effect antique silver finish and adorned with beautiful ornate designs. 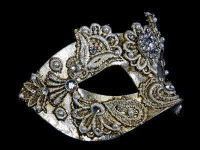 Faux diamond crystals bring a rich highlight to the mask. 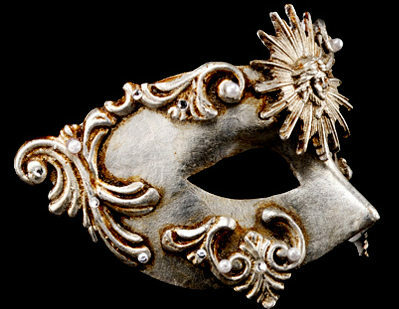 Elegant and sophisticated, you will want to wear this beautiful luxury ball mask at every opportunity and will treasure it forever. 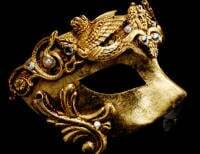 All masquerade ball masks are hand made and painted in Venice & this one can be worn by a man or lady.